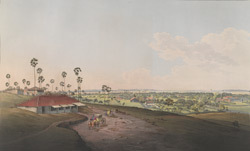 The view represents that "part of the Island between the Hill of Belmont and the Breach Water, Malabar Hill to the left, the Breach or Causeway in front, and the country extending from Love Grove toward Mahim on the right terminating the scene". The Great Breach, or Hornby Vellard, appears in the foreground. Begun in 1782 by William Hornby, Bombay's governor, it was one of the first major engineering projects implemented to transform the seven islands of Bombay into one landmass. It was constructed to prevent the low-lying areas of Bombay from being flooded at high tide. There is a romantic Muslim legend attached to Love Grove, on the right of the view, concerning two drowned lovers, today commemorated in Hadji Ali's mosque.